Australia's 1991 World Cup final win over England brought rugby union into a new era of money, media attention and mass public awareness. This classic match capped a spectacular tournament televised in 70 countries and generating £40 million revenue, though it was to be another four years before the game officially went professional. Most of England's team had been together for three years, 11 of them had more than 20 caps and eight were over 30 years old. They reached the final playing a forward dominated 10-man game, seeing off France and Scotland in the knock-out stages, though they had lost to New Zealand in the opening match. Australia were greener, only four having passed 20 caps, and more dynamic. They conceded only three tries all tournament, and were able to give star winger David Campese free rein in attack without compromising their dominance. Thrilling knock-out matches against Ireland and New Zealand in Dublin saw them reach Twickenham as odds-on favourites with the bookmakers. 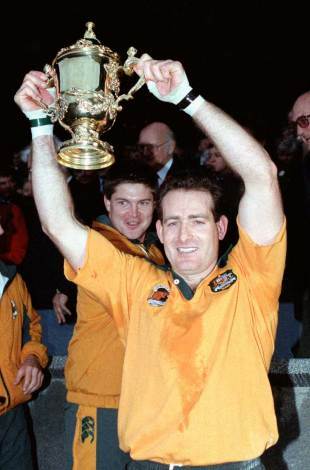 Campese was the player of the tournament with six tries, but his most notable contribution to the final was a deliberate knock-on, intercepting a pass from Peter Winterbottom to Rory Underwood that would probably - not certainly - have sent England's flying winger in for a second half try. Much was made of it by the media then, and a great deal more since, but it was the kind of professional foul seen in games week in, week out. Though it would earn a yellow card now, England fly-half Rob Andrew wrote in the Times, "Nobody in our team said a lot about it at the time." Myth also has it that Campese's pre-match goading caused England to change their game plan to the open, running style they used for the first time in the tournament. Would Moore, Probyn, Dooley, Andrew and co. take any notice of Campese's claptrap? Far more likely is that the change reflected the 40-15 thrashing England took in Sydney four months earlier. Australia's pack in 1991 was stronger than at any time since, so England's change of tactics made sense, in theory, and startled the Aussies. But England's backs hadn't sparked to creative life for a while and, as the Times warned before the match, "articulate back play is not to be suddenly discovered in the hurly-burly of a World Cup final." So it proved, but those who paid over £700 on the black market for £30 tickets were not disappointed. Former Wallaby Anthony Abrahams distributed 7,000 copies of Advance Australia Fair to Australian fans because most of his compatriots "don't know the bloody words". If England's tactics ultimately proved naive, Australia's defence was stretched to the limit. 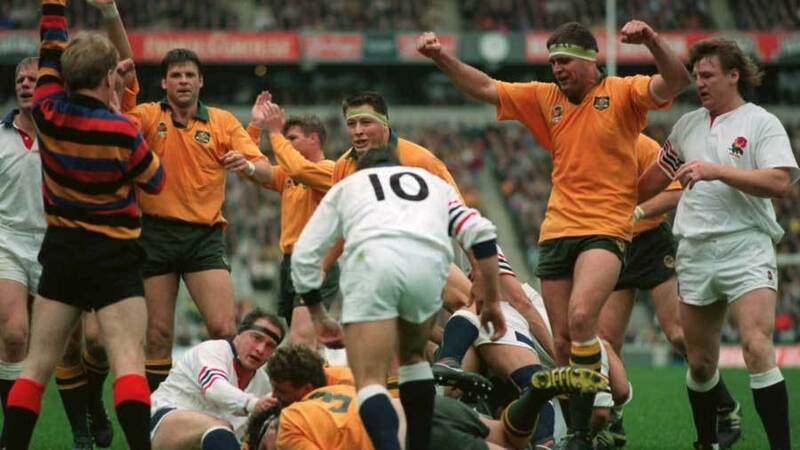 Marshalled by the old heads at half-back, Nick Farr-Jones and Michael Lynagh, the Wallabies proved equal to the task. The Times reported that "England's pack could not have played any better, notably in the loose where the advancing years proved no barrier, but the backs could not suddenly construct a game they have deliberately avoided for so much of the last year." Australia, confident and technically superior, could rely on back-row men Simon Poidevin and Willie Ofahengaue to reinforce the backs, and even John Eales made a desperate, try-saving tackle when Andrew seemed destined for the try line. Lynagh kicked a penalty to open the scoring after 25 minutes. Three minutes later came the try that decided the match. It was, appropriately enough, a team effort. Tim Horan broke from deep in Australia's 22 to take play towards Twickenham's south-west corner, where England scrambled the ball into touch. The resulting lineout was won by Ofahengaue five metres out and the Wallaby pack drove for the line. Props Tony Daly and Ewen McKenzie flopped over together, Daly being credited with the score. Lynagh converted for a 9-0 lead. England had the greater share of possession and territory in the first half, but nothing to show for it, Jonathan Webb having missed two penalties. Lynagh and Webb added a second half penalty apiece before the notorious knock-on by Campese in the 70th minute. Had England scored then (or been awarded a penalty try), it would have been 12-9. As it was, Webb hoofed over the penalty for the last points of the match. The better team won; it's unlikely England would have won had they stuck to their 10 man game, but there was no shame in failing gloriously. Carling acknowledged, "We made our mistakes - and they cost us." Farr-Jones said the final was far more wearing than their semi-final: "At the end of the game, I and my team-mates were exhausted," he said. "Against the All Blacks, we felt we could have gone on another 40 minutes. England ran at us so many times, we had to make so many tackles that it was a far more tiring game." Australia's style and tenacity made them respected and worthy champions. David Miller, in the Times, was not universally enamoured: "I prefer watching Campese to listening to him. Having told England for a fortnight how to play, he then deliberately knocked on and proceeded to say afterwards that 'attacking play doesn't win in rugby, defence does'. Amid a splendid bunch, he was a shade too smug."